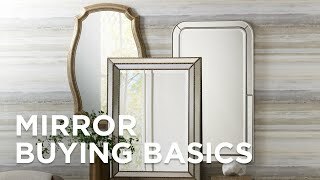 Wow your guests with this gorgeous arch top wall mirror. Grace your home with this elegant arch top wall mirror. Its arch design perfectly blends in with a rustic or traditional home to give off a nostalgic feel. An aged silver finish further complements this arch top wall mirror and is sure to be a great complement for your home. 31 1/2" wide x 52" high x 1 1/4" deep. Hang weight is 29 lbs. Glass only section is 27 1/2" wide x 48" high. Arch wall mirror from Cooper Classics.